How do you get replacement parts? In a developed country the answer is pretty simple. For some things (e.g., car parts), you may need to go through a dealer or specialized retailer. For others, you may be able to just stop by a general hardware store. But what if you are in a developing nation? Then you might have to get creative. 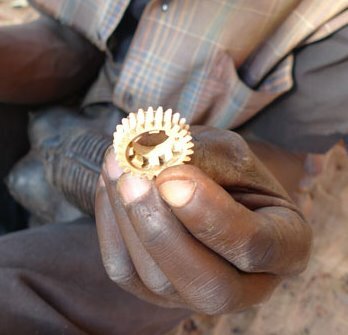 Markplace had a fun report about craftsmen in Mozambique carving replacement parts (like the gear above) out of ebony (Ebony woodcarvers learn to craft machine parts, Oct 3). Young Makonde sculptors apprentice for years, sanding and polishing the works of their teachers. They study the ornate canes and traditional busts that are still a bestseller to tourists. But the expert woodcarvers are also finding a market for more “functional” sculptures. Manuel Xavier is a customer here at the woodcarvers’ collective. He repairs gas stoves for a living but has trouble finding spare parts. MANUEL XAVIER: Here in the north, there is a lack of equipment for gas stoves. A month ago, Xavier got a call from an unhappy customer. She said that the knobs on her stove had broken off. XAVIER: I told the woman who owns the stove, “That part isn’t sold here in the North.” Not in stores, or anywhere else. So I decided to have them made out of Pau Preto. And versatile. Sculptors have carve parts for espresso makers, sewing machines, and motorcycles. For film projectors, and even computers. Patterson says that storekeepers in Mozambique don’t have the capital to keep spare parts in stock. The article goes on to report that doing replacement parts is harder than doing creative sculptures. For the latter, there is no formal standard of perfection. Replacement parts, however, must conform to what they replace for them to be useful. It’s a cute story, but does it have any relevance in the West? We’ll never have hand carved replacement parts, but what if they could printed on demand? That’s one of the possibilities discussed in a recent Strategy and Business article (A Strategist’s Guide to Digital Fabrication, Autumn 2011). Here is a gratuitous video of a Schroeder-ready bust of Beethoven being printed to demonstrate the kind of technology in question. As early as 2020, every auto dealership and home improvement retailer may have a backroom production shop printing out parts and tools as needed. Manufacturers that figure out how to make their wares out of printable composites, investing now in the requisite changes in materials, could have a considerable advantage. For the past 50 years, the separation of manufacturing from R&D has produced engineering graduates with too little hands-on manufacturing experience. Now that fabrication tools are increasingly driven by digital information, the two functions can work more closely together. Many factory-floor workers are already highly skilled at reading and interpreting design files and operating and maintaining machinery, and should be seen as allies in adapting shop processes to match new tools. As computer-controlled fabrication tools become more flexible and product runs become shorter, a typical factory worker might be making tripod handles in the morning and watchbands in the afternoon, and the gap between R&D and manufacturing will narrow. Digital fabrication may not complete eliminate economies of scale, but it does make experimenting with some close to the ultimate production method easy. Rapid prototyping and testing out lots of designs should be feasible and that should create opportunities for innovation. Probably the most disruptive element of this technology is not the tools themselves, but the maker culture — the community of people who sell, use, and adapt the tools of digital fabrication. This community is, in effect, a self-organizing global supply chain, consisting of hundreds of interlinked businesses, user groups, online shopping sites, and social media environments. Online fabrication services such as i.materialise (a Belgian company founded in 1990) and Sculpteo (a Paris-based service founded in 2009) provide on-demand 3-D printing and laser cutting in small volumes and at rates that are affordable to individuals. Customers upload a digital design and receive the corresponding physical object by mail a few days later. Ponoko (a New Zealand startup founded in 2007) and Shapeways (a Netherlands-based spin-off of Philips Electronics) go one step farther: They are supply chain management tools for garage inventors, enabling creators to exchange plans and instructions, coordinate production, and sell their designs and fabricated objects directly to the public. Complementing these businesses are open repositories like Thingiverse, a website created and managed by MakerBot, a New York–based manufacturer of 3-D printers that was founded in 2009. At Thingiverse, people can freely download one another’s designs and programming code for such ubiquitous products as gears, bottle openers, and coat hooks. Distributed manufacturing networks like Makerfactory and 100kGarages enable the communities further by connecting digital fabricators with potential customers, allowing customers to post job requests that are then bid on by individual fabricators. There are also successful new small enterprises using digital fabrication to make customizable iPhone accessories (Glif), jewelry (Nervous System), cases for prosthetic limbs (Bespoke), and other products such as kitchenware, toys, and furniture. They generally make their goods on demand, with short production runs, catering to both local and global markets. The notion that local car dealers will be printing parts assumes that someone — either the car makers or their suppliers — has chosen to make those designs available. As is argued here, there is no reason why available cannot mean public and public cannot mean customizable. OK, car parts may be a bad example. Car makers may want to protect their dealers’ margins by giving them at least a temporary monopoly on parts. But in general there are many products that might benefit from some degree of customization. This does not require that a printed product be as cheap as conventional manufacturing. Rather it means that a printed product has to be sufficiently custom and available fast enough to justify a premium. The elimination of all economies of scale may be a stretch but the ready availability of inexpensive. customizable designs may not be. Don’t forget about Stratasys right up the road in Minneapolis. (www.stratasys.com). The article gives the impression that 3D printing can make any part and that is not far from the truth. A major ommission though is that 3D printing can not make any part out of ANY material. Most of the materials for 3D printing are some type of plastic. 3D printing of a plastic gear is not much help when the part is needed in an engine that runs at high temperature and pressure. That being said though, the technology is amazing. Stratasys can print parts that have moving components, e.g. a sun and planetary gear set. True enough, Ed, although stainless steel, titanium, silver and gold are four metals that I know are currently being used in 3D printing. It won’t be long before others are introduced. Your post is very interesting and offers a lot of great insight into both the realm of handcraft and digital craftsmanship, and how they are beginning to interrelate. I never really thought about the small parts of appliances, electronics, and other products, and how they are sometimes unable to be replaced, especially in developing countries. Personally, I am very interested in the operations management field, specifically with supply chain management. Because of the infrastructure that is present in some of these countries, I am interested in learn more about the specific complications associated with gaining access to these regions and providing products for a larger demographic of people throughout the world. Obviously, costs related to bringing a good to an area with a relatively low demand for said good are going to be high, but is that the only factor withholding consumers from obtaining the components they need or desire? Especially with the small parts of goods, like knobs and switches, which seem to be essential to the proper function of the product, why are they not available, even at a raised price, to the people that need them? That said, they seem to be getting along just fine carving and crafting their own pieces, and doing so at a lower price. The bulk of your post, though, discusses a new trend associated with the same type of craftsmanship and artistry displayed in Mozambique and other developing nations, but this time, instead of human hands doing the word, it is done by machine. Robotics and machine-based technology has begun to dominate the manufacturing field, but how do you propose, if at all, this same type of technology is used in the developing nations mentioned before? I see the switch to machine manufacturing as a version of outsourcing, but this time, instead of sending work offshore, the work is sent to another room in the factory and the part is fabricated there. I find the trend to be very interesting and it may solve some of our outsourcing problems, but I also think it will detract from domestic business, taking away manufacturing opportunities from local companies that may have monopolies on the product, as you discuss at the end of your post. Overall, digital fabrication has a lot of potential to change the operations industry, especially with potential in developing economies, and I think you do a good job in highlighting that. BTW “rule 34” by Stross is a near future sci-fi book with illegal 3d printing as a major plot point. It is pretty good so far. Thanks for that link to the book. I’m going to check that out. I’ve been exploring for a little for any high-quality articles or weblog posts on this kind of house . Exploring in Yahoo I eventually stumbled upon this site. Reading this info So i am glad to exhibit that I have a very just right uncanny feeling I discovered exactly what I needed. I most no doubt will make certain to do not omit this site and provides it a look on a continuing basis. Hello, yeah this post is in fact fastidious and I have learned lot of things from it on the topic of blogging.